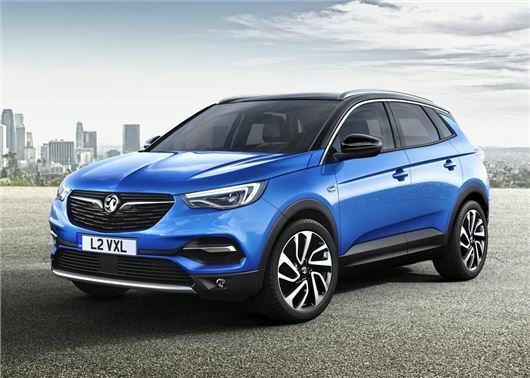 Vauxhall has released details of its new SUV, the Grandland X. The all-new model will use the same mechanical platform as the Peugeot 3008 and cost in the region of £22,000 when it goes on sale in early 2018. The Grandland X will be Vauxhall's first all-new model since it was acquired as part of Peugeot's £1.9 billion buyout of General motors. However, before that deal was signed in March, the two carmakers agreed to share tech as part of a strategic partnership, which means the Grandland X borrows a lot of its underpinnings from the latest 3008. The Grandland X will also be built in France and - at 4.5 metres long - be Vauxhall's largest SUV, fitting above the Mokka X and Crossland X in the range. Like the smaller Crossland X, which will go sale in mid-2017 - the Grandland X features a rugged design, with highset LED headlights, metal skid plates and plastic cladding around the wheel arches and door sills. Inside the SUV will boast space for five adults, while boot space will range from 514 litres (with the rear seats in place) to 1652 litres. The dashboard will feature the standard layout, with a central colour touchscreen, which will be linked to Vauxhall's latest OnStar system. As well as providing access to navigation, DAB and in-car setttings, OnStar will also allow the user to book a hotel room or find a parking space. Powertrains are still to be confirmed, but we expect the engine line-up to be spilt across four-cylinder petrols and diesels, which will be linked to manual or automatic transmissions. There are no details of four-wheel drive yet, but Vauxhall has said it will offer Peugeot's Grip Control system as an optional extra, which will adapt the torque distribution between the front wheels to maximise traction. Sack the designers, if that's the best they can do, they all look very much alike to me, and I certainly will not be chopping my 2014 Mokka 1.7 se in for any of them, And Peugeot underpinnings do nothing for me either, apart from underwelm me.